Two miles south of Furnace Creek, the Golden Canyon is a short gorge that cuts into brightly colored sandstone rocks in many glowing shades of orange, gold and red, with the ever-present deep blue sky above making the hues seem especially sharp and intense. Once there was a paved road running up the whole length but this has long been disused and most sections have eroded away. 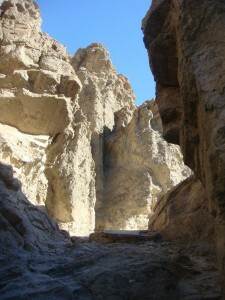 Now, travel on foot is the only option, and the hike is one of the most popular in Death Valley national park. Trail guides describing numbered points of interest are available at the nearby carpark. The Trail: The canyon is not particularly enclosed though some of its short tributaries are more narrow. The drainage gains elevation gradually, branches several times then ends quite abruptly after about 1 mile, at the base of high sandstone cliffs – a natural amphitheatre known as Red Cathedral, where the majority of visitors turn back though a longer trail forks south and continues through the multicolored badlands beneath Zabriskie Point, a trip of 4 miles in total. The junction is a few hundred meters south of the cathedral; the path starts by climbing quite steeply up an exposed slope of whitish earth to a high ridge beneath a protruding rock formation, a point which overlooks a wide area of fantastic badlands and canyons. You can see more of my pics from our Golden Canyon Hike here.